Many Investors manage their own rental property portfolio because they know it’s a great way to keep costs down. With the right tools on hand, such as a professionally drafted South Australian rental agreement, you can protect your investment by defining your relationship with your tenants, shielding you from potential liability. 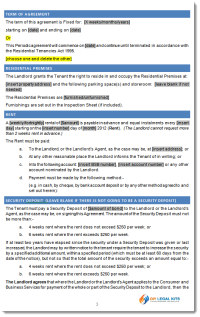 In fact, a solid real estate tenancy lease should form the foundation for the ongoing relationship between you and your tenant. 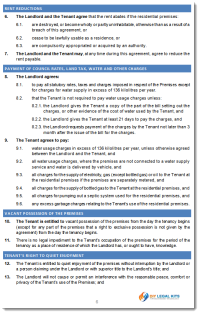 You can use this tenancy lease agreement if you as a property owner agree to rent residential premises to another person (tenant) for the purpose of use as a residence, in exchange for rent. This residential lease has been drafted by specialist lawyers in accordance with South Australia’s Residential Tenancies Act 1995, so you can be confident your interests are protected and your tenant treated fairly. It is available for immediate download as an MS Word template. Just insert the correct information in the appropriate fields and go to print. The kit includes easy to follow instructions and can be used time after time. This South Australian Tenancy Kit includes an instructional video that walks you through the process of completing your agreement. It can be viewed in the Members Area after purchase. 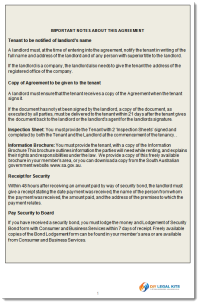 Your ready-to-use South Australian Basic Residential Tenancy Agreement provides the documents you need to get your tenancy under way. By upgrading to the Premium Residential Tenancy Kit you'll receive the documents and forms you need to manage your tenancy on an ongoing basis. Inevitably issues will crop up and the Act is clear, in its direction, that communications with the tenant must adhere to prescribed formats. Just think how much easier it will be to have the correct form or notice on hand, any time you need them! In just a few minutes you'll have everything you need to rent your South Australian property.